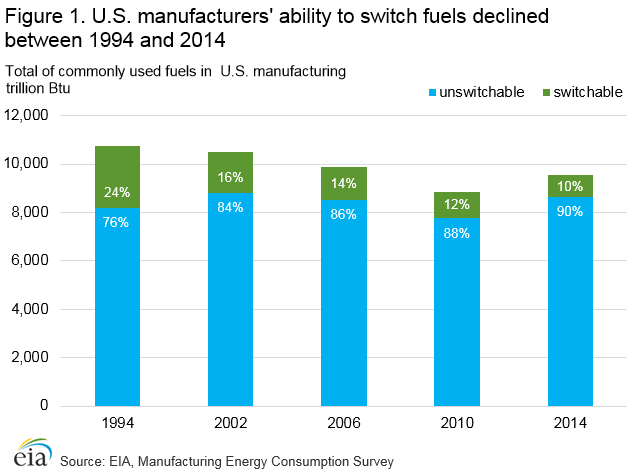 In the United States, the capability of the manufacturing sector to switch the fuels it uses declined continuously between 1994 and 2014, according to data from the U.S. Energy Information Administration's (EIA's) 2014 Manufacturing Energy Consumption Survey (MECS). Among the most commonly substitutable fuels used in manufacturing, the amount that could readily be switched in less than 30 days dropped from 24% in 1994 to 10% in 2014 (Figure 1). U.S. manufacturing fuel-switching capability in the MECS can be interpreted as manufacturing's ability to make choices to take advantage of relative price differences, to deal with supply shortages, or to handle other exigencies. The share of natural gas used in U.S. manufacturing energy consumption increased between 1994 and 2014, while the shares of other fossil fuels, such as coal and petroleum products, decreased. Shifting use of these energy sources was likely the result of increased availability of natural gas in the United States, generally lower natural gas prices relative to other fuels, and the ability of natural gas to comply with environmental regulations. These factors led manufacturers to focus on natural gas use and to discount the value that fuel switching capability had provided in earlier years. The MECS does not measure the capability to switch from fuels primarily produced onsite as waste or byproduct, or from atypical purchased fuels such as petroleum coke. Energy source usage for nonfuel purposes (for example, chemical feedstocks) is not considered. In the case of manufacturing use of electricity purchases, the normal substitution would be onsite generation. When onsite generation is substituted for electricity purchases, MECS respondents report the alternative as the quantity of fuel that is used to generate the electricity rather than the quantity of electric generation. The MECS collects information on how much U.S. manufacturing sector energy consumption could have been switched, and how much could not for a variety of commonly used fuels. The unswitchable portion of U.S. manufacturing sector natural gas consumption, the most predominantly used energy source, increased consistently relative to the total amount of natural gas fuel consumption between 1994 and 2014, regardless of the level of consumption (Figure 2). The total U.S. manufacturing sector consumption of natural gas and all other fuels in any year depends on the level of production of manufacturing products, on energy efficiency, and on the relative prominence of high natural gas consuming industries in the manufacturing total. 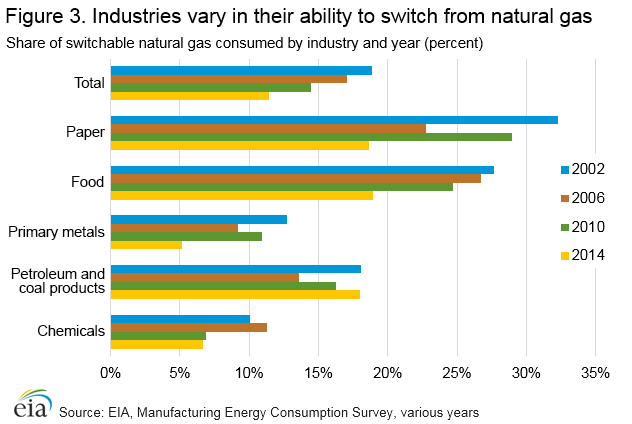 The ability within the U.S manufacturing sector to switch fuels varies according to industry type. The five industries that consumed the largest amount of natural gas in 2014 were Food, Paper, Petroleum and Coal products, Chemicals, and Primary metals (Figure 3). Together, they accounted for 81% of U.S. manufacturing fuel use in 2014. Chemicals and Primary Metals showed less ability to switch from natural gas than the total for manufacturing in each of the four survey years shown between 2002 and 2014 Paper and Food showed substantially more ability to switch. Although the percentages shown in Figure 3 reflect only use of energy for fuel, not feedstock, chemical companies that have a large natural gas feedstock need likely would find it less useful to invest in fuel-switching flexibility than industries without such requirements, as natural gas purchasing is already a necessity. For example, the manufacture of nitrogenous fertilizers most commonly requires ammonia, which uses natural gas as a key ingredient. 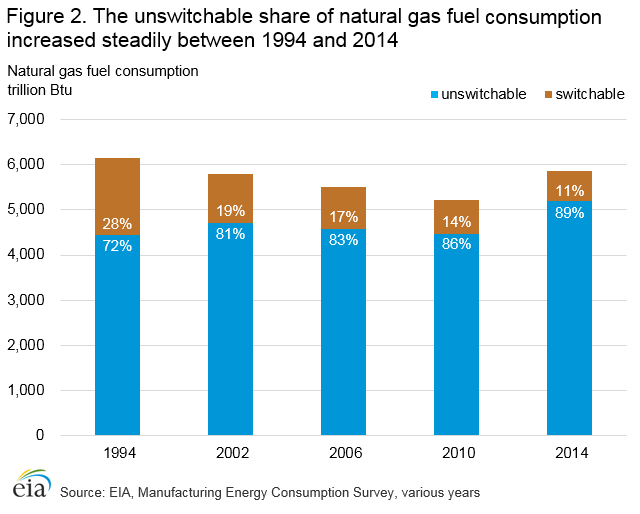 In that subindustry, 96% of the natural gas consumed as a fuel was not switchable in 2014. MECS divides the capability for manufacturing fuel switching into three categories. First, for each quantity of fuel use, a minimum level of unswitchable actual consumption exists, which is the amount of fuel that could not be switched into another fuel (Figure 4). Similarly, an additional amount of switchable actual consumption exists that could have been switched into another fuel but was not. Finally, each fuel has a potential additional consumption amount, which is a measure of all possible switching into the fuel from other sources that could be added to the actual consumption. Together, all three components represent the maximum possible consumption of any particular fuel. The discretionary-use rate measures the range of choice around a manufacturer's actual consumption of a fuel. How close their actual consumption is to the minimum required (unswitchable actual consumption) or maximum possible (sum of the three components defined above) is an indication of their preference for that fuel in the reporting year (Figure 4). In 2014, manufacturers chose to use close to their maximum discretionary ability to use natural gas and coal, which were 79% and 80% of the discretionary range, respectively. Conversely, manufacturers used close to the minimum possible of the petroleum-based distillate and residual fuel oils and of LPG. Electricity receipts had a 51% discretionary use, but that fuel also had the smallest relative discretionary range—4% of the maximum possible consumption. Discretionary use rates for the fuels mentioned above remained relatively stable between 1994 and 2014 except for residual fuel oil and electricity receipts. Discretionary use of residual fuel oil declined from a peak of 25% in 2006 to 5% in 2014. The discretionary use of electricity receipts rose steadily from 25% in 1994 to 51% in 2014. For most applications, the available substitutes for electricity purchases would be the fuels used to generate onsite electricity. The reason for the growth in preferring purchased electricity compared with available onsite generation is not clear from MECS data. In 2014, the reason most cited by respondents for not being able to switch fuels used in U.S. manufacturing was that the equipment onsite would not support it. That reason accounted for 78% of unswitchable natural gas, 75% of unswitchable electricity receipts, and 62% of unswitchable coal. If equipment was not the reason, manufacturers reported reasons including lack of availability of alternative fuels, environmental restrictions on alternative fuels, and restrictions of long-term contracts. Because manufacturing respondents could select multiple reasons for not being able to switch, EIA cannot isolate the non-equipment related choices. Two percent of unswitchable natural gas and less than 1% of electricity were attributable to environmental restrictions on the alternative. MECS did not collect fuel-switching data on the 1998 survey. The fuels MECS considers for fuel-switching assessment are electricity receipts, natural gas, coal, distillate fuel oil, residual fuel oil, and liquefied petroleum gases (LPG). Feedstock or nonfuel use is excluded. The electricity receipts category does not include onsite generation of electricity. EIA, Energy Use and Energy Intensity of U.S. Manufacturing—Data from the 2014 Manufacturing Energy Consumption Survey (MECS), https://www.eia.gov/consumption/manufacturing/reports/2014/enduse_intensity. EIA, State Energy Data System, Table ET5. Industrial Sector Energy Price and Expenditure Estimates by Source, 1970-2015, https://www.eia.gov/state/seds/data.php?incfile=/state/seds/sep_prices/ind/pr_ind_US.html&sid=US. EIA, Annual Energy Outlook 2013, Legislation and Regulations, https://www.eia.gov/outlooks/archive/aeo13/legs_regs_all.cfm#staterene. 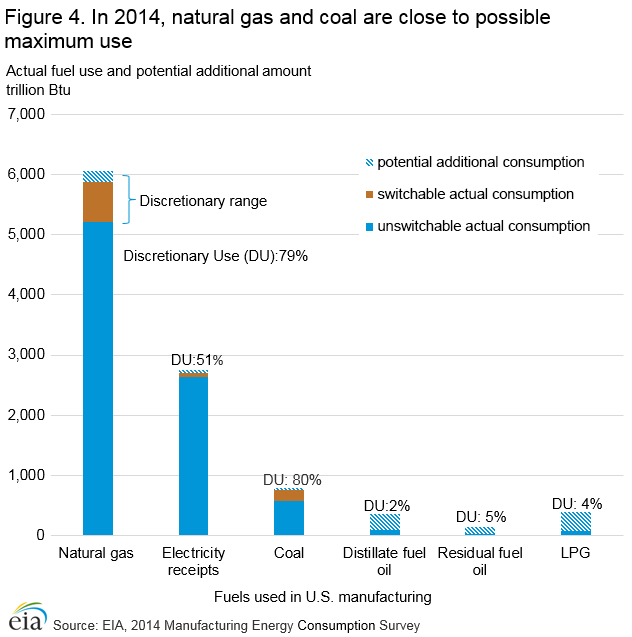 EIA, MECS 2014, Table 10.2, https://www.eia.gov/consumption/manufacturing/data/2014/xls/table10_2.xlsx. EIA, Manufacturing Energy Consumption Survey, Tables 10.20 to 10.25. Much of the data on other fuels was withheld for data quality or rounding.